French leader Francois Hollande has announced that France will invite representatives from all 72 countries involved in World War I to take part in its annual Bastille Day military parade in July 2014. Hollande added that Germany’s president, Joachim Gauck, will attend a ceremony in France on 3 August 1914 – a century after the two countries declared war on each other. ‘I asked the president of the Federal Republic [Germany] Mr Gauck to come to France on the occasion of the commemoration of this tragic act, he has accepted and I thank him for that,’ said Mr Hollande during a speech at the Elysée palace launching France’s Centenary commemorations. French authorities added that war dead from among the allies, Germany and Austria-Hungary will receive equal treatment when a memorial is built in Notre Dame de Lorette in the Pas-de-Calais, northern France. Some 600,000 soldiers who died on the battlefield in the area will have their names listed in alphabetical order. 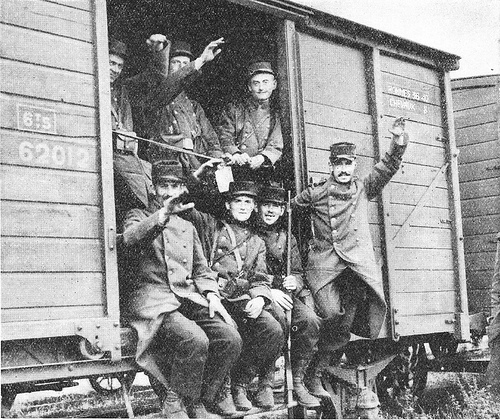 France itself lost around 1.4 million soldiers killed during the war. ‘There is no municipality in France that did not have victims in World War I,’ Hollande said, adding that World War I was, ‘the hardest trial that the French population had ever known’. He also promised to create a space commemorating soldiers who were shot for cowardice and desertion in war to be built at Paris’ war museum, Les Invalides. This entry was posted in Events and tagged 1914, 2014, 3 August 1914, centenary, France, Francois Hollande announces plans, Les Invalides, Notre Dame de Lorette, Pas de Calais. Bookmark the permalink.